Why is the Arkansas Legislature cutting taxes for the Top One Percent? 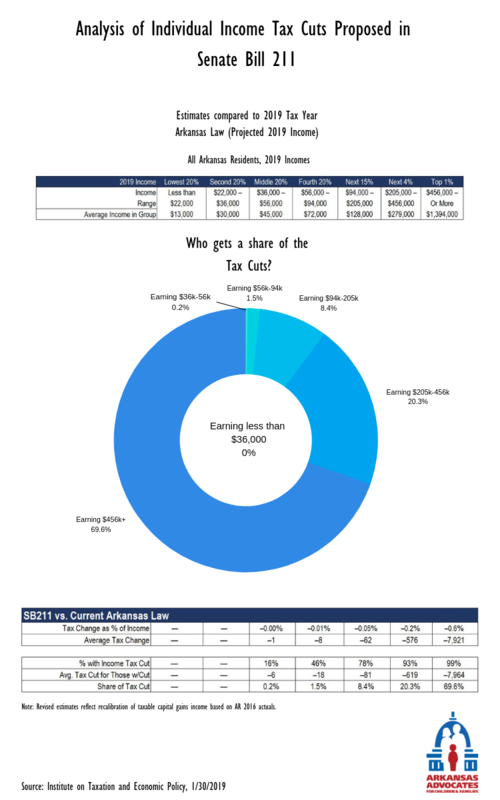 One day after the Governor Asa Hutchinson’s tax plan failed in the full Senate, Republican Senator Dismang re-introduced the bill. But this time, it passed. When politicians talk about tax relief, we should ask, “Who for?” Arkansans of course want tax relief, but they do not want what the Arkansas Legislature is scheming up. Right now, SB211 hoodwinks voters, claiming to help the Arkansas economy. Though instead of cutting your taxes, the Arkansas Legislature is about to pass a $100 million giveaway to the richest Arkansans. Give the top one percent a tax cut instead of giving working families tax relief. Steal money from schools, hospitals, and state services to give the rich more money. Push an already strained state budget beyond the breaking point for years to come. But there’s a better option! Good lawmakers can rally around real tax relief, for working families, in the form of an Earned Income Tax Credit. This is a bi-partisan approach that doesn’t just favor one percent of Arkansans at the expense of the rest of our state. This is a proven formula, adopted by 29 states throughout the country, that puts tax dollars directly back into the pockets of working families. That’s what our priority needs to be. That’s what Arkansas Democrats are fighting for.